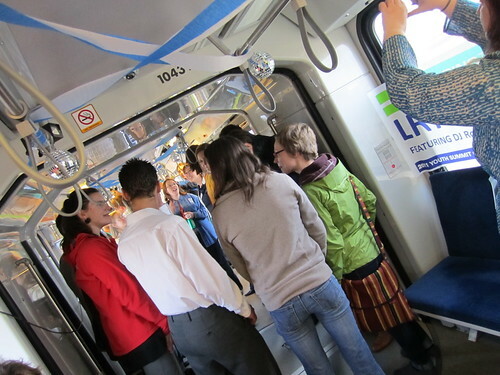 Ever wonder what a dance party on the LRT would look like? I had the opportunity last weekend to find out! 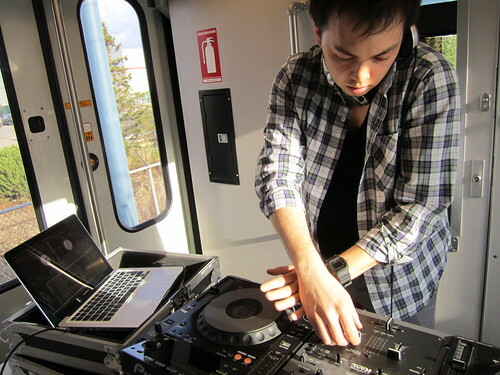 The Saturday evening activity for delegates of the 2011 Youth Summit on Sustainable Transportation was a DJ Dance Party on a chartered ETS LRT train. While we were touring the D.L. MacDonald LRT Garage in the afternoon, staff were busy getting the train prepared, adding streamers, disco balls, and lights to the interior. DJ Rob Wong also got setup with all of his gear and two giant speakers, one at each end of the train. After a quick dinner, we all boarded the party train! The train circled the garage a few times, apparently to make the most of our time. We then travelled the length of the LRT line, from Clareview all the way to Century Park, before travelling back as far as Churchill Station to let some people off downtown. In all, we spent about an hour and half on the train. The music was loud, and slowly but surely most people started dancing! It was easier than you’d think to dance on the moving train, though whenever there was a sudden jolt it was just another reason for everyone dancing to yell and cheer. There were a few people who chose to just sit through the entire experience. It kind of reminded me of a high school dance in that way – slow to get going, with some people sitting off to the side the entire time. Unsurprisingly, the best part of the trip was the underground portion where it was darker. 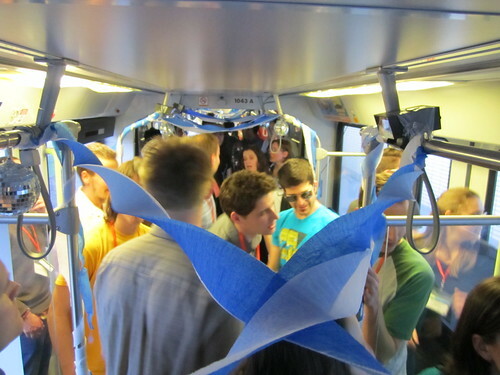 Tinted windows, dimmed lights, and some…uh, lubricant…would have made the dance party more like a dance party and less like a bunch of people moving around on the train! Maybe I’m just getting old. That said, it was still a lot of fun. I absolutely love the concept of taking the LRT, normally seen as somewhat mundane (trains just get you from A to B), and using it for a completely different purpose. I think everyone enjoyed themselves! Obviously ETS doesn’t normally charter trains for this purpose, but I think they could if they wanted to. It’s certainly a unique experience! You can see more photos here, and see more videos here.